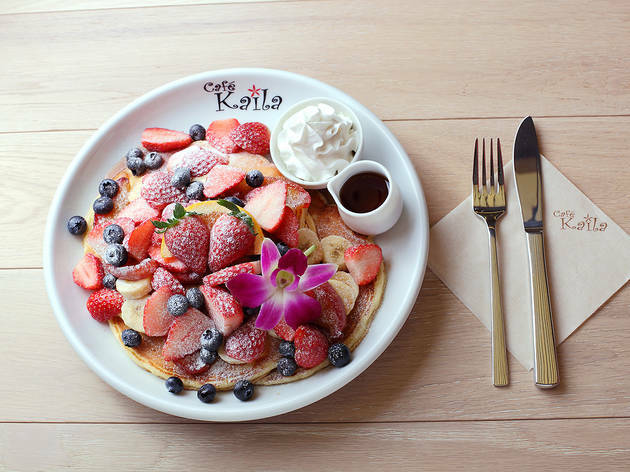 Omotesando's Cafe Kaila is probably the most popular Hawaiian pancake eatery in all of Tokyo, and that's saying something: two-hour queues on weekends are the standard. 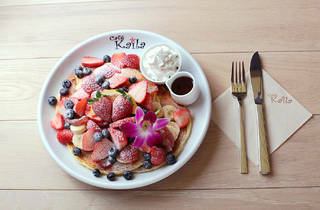 Now, visitors to Tokyo Disneyland can also get a taste of Kaila's fruit-laden pancakes, French toast and waffles with the opening of this new shop inside the Disney-run Ikspiari shopping mall. The restaurant has room for around 140 customers, which is double the capacity of the Omotesando location, but don't expect being able to walk in – as we said, the most popular. Don't bother. The service is poor, especially considering the high prices, and we left after just 5 minutes, after two very big mistakes by multiple staff were made (which means the restaurant operates this way as their standard). First, we came at a slow time. No one was waiting, no lines, and multiple tables were empty/open inside the restaurant. Mistake #1: They made our small group of 3 wait outside anyway (??? ), instead of seating us. 5 minutes later (after realizing half their tables were open?) they walked us from the front cash register waiting area to the eating area and on the way, the server tried to sell us merchandise on the wall, slowing us down, showing us t-shirts and other things we can't eat. We noticed many open tables once we got into the eating area and were like, huh?? Why didn't they seat us? Once seated at the table, we immediately began to order, as they gave us menus outside when we first arrived. We already knew what we wanted. So we began to order. then Mistake #2: The server was taking our order, entering our selection into her electronic pad, and mid-order, she stops and says, "one moment please" then walks away, where we watch her take a drink from the kitchen and deliver it to another table. We got up and left and told another person about their mistakes. But that's how this place functions, poorly. How many more mistakes would they make? We weren't waiting to find out... I guess the food is not good either. I'm glad we left immediately and that we spoke out.